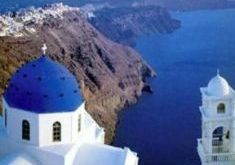 Explore our selection of our predefined Greek island hopping tours and travel packages. Our holiday itineraries to the Greek isles are very flexible, and can be changed to fit your requirements. The Greek islands are the main characteristic of the country's morphology and an integral part of its culture and tradition. The Cyclades are the most touted island cluster of the Aegean and includes some of the most beautiful Mediterranean islands! The spellbinding co-existence of white and blue in Cycladic architecture; the traditional way of life; the island songs; the warm hospitality; the stark landscape embroidered with deserted country churches; the stunning coasts; and the gorgeous beaches, all make a trip to the Greek islands a unique and unforgettable experience. This Greek Island Vacation includes 2 of the most beautiful islands in Greece. In cosmopolitan Mykonos meet the international jetset, swim in the cristal clear waters, and enjoy the renowned night life. 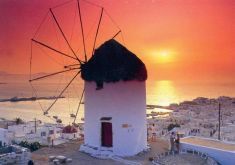 In Santorini enjoy the sensational and romantic sunsets, the fascinating caldera views, and the black and red beaches. The ancient city of Athens is today a vibrant megalopolis with nonstop nightlife, creative cuisine, and sites both ancient and modern. 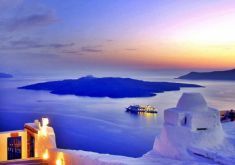 In Santorini enjoy the sensational and romantic sunsets, the fascinating caldera views, and the black and red beaches. The ancient city of Athens is today a vibrant megalopolis with nonstop nightlife, creative cuisine, and sites both ancient and modern. 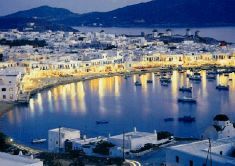 In cosmopolitan Mykonos meet the international jetset, swim in the cristal clear waters, and enjoy the renowned night life. 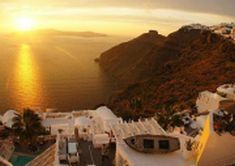 In Santorini enjoy the sensational and romantic sunsets, the fascinating caldera views, and the black and red beaches. 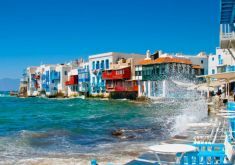 This 10 day Greek Island Hopping tour can be combined with a stay in Athens before or after the islands. This itinerary is suitable for those who prefer not to include a stay in Athens.